This image made from a video taken on July 13, 2018 and released by Chiang Rai Prachanukroh Hospital, shows Somphong Jaiwong, one of the 12 boys rescued from the flooded cave, in their hospital room at Chiang Rai Prachanukroh Hospital in Chiang Rai province, northern Thailand. The video was shown during a press conference at the hospital Saturday, July 14, 2018. The 12 boys and their soccer coach rescued from a flooded cave in northern Thailand are recovering well and are eager to eat their favorite comfort foods after their expected discharge from a hospital next week. In video messages of the boys shown at a news conference on Saturday, they are seen wearing surgical masks, a safeguard against infection that's been taken since the last of them were pulled from the Tham Luang cave on Tuesday, ending an 18-day ordeal. Doctors said that Friday, when the videos were recorded, would be the last day they'd have to wear them. Public Health Minister Dr. Piyasakol Sakolsattayatorn, who led the news conference at Chiang Rai Prachanukroh Hospital, said all 13 — the dozen boys, who range in age from 11 to 16, and their 25-year-old coach — were expected to be discharged from the hospital on Thursday. "All of the 13 people, their physical bodies are strong, and fit. Regarding infections, through the medical evaluations in the first days there may be some of them that had minor pneumonia, but now all is cleared, no fever," Piyasakol said. Several were also reported earlier to be recovering from minor lung and middle ear infections. The remaining four boys trapped in a flooded cave in Thailand were rescued by a team of divers along with their soccer coach Tuesday. 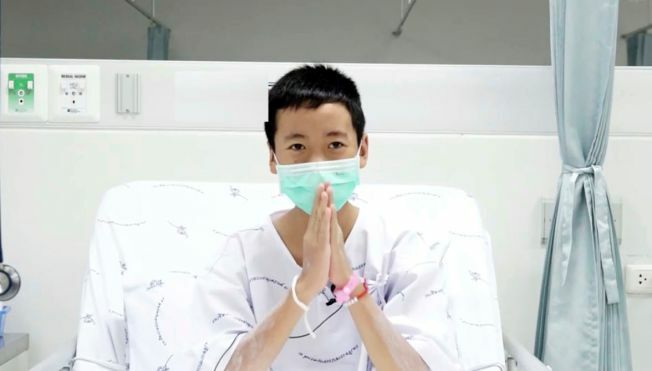 Most of the boys, who were shown in their hospital beds, looked relaxed, and began their brief statements with a "wai," the traditional Thai greeting of hands raised to chest level with palms together. A few also gave the two-finger victory sign and raised a fist. One of the 14-year-olds, Ekarat Wongsukchan, whose nickname is Biw, playfully raised his two arms in a boxer's victory stance as laughter was heard in the background. "Hello, my name is Biw, I am fine. I want to say thanks to everyone that worried," he said. All 13 offered thanks for the support they've been given. Asked by an off-camera interviewer what they were looking forward to eating, their wish list included slow-cooked pork leg with steamed rice, fried crispy pork, roasted red pork, sushi, steak and KFC. Adul Samon, a stateless 14-year-old sent to Thailand for schooling by his ethnic minority parents across the border in Myanmar, spoke in Thai and then in English: "Hello, I am Adul. Now I am very fine. I am very thank you so heavy, thank you so much." Adul is perhaps the best known of the boys because he was the one speaking English in the video taken inside the cave when the team members were first found by two British cave divers on July 2, nearly 10 days after being trapped by flooding. In the video from the hospital, he also holds up a paper, apparently a drawing of his teammates, whom he points out one by one. Public Health Minister Piyasakol gave a prognosis for the boys, and said, "Psychologists have been talking to the kids, with the kids, their mental well-being is good today." "Even though they are about to leave in the days ahead ... they aren't as strong as a normal person, they still need to rest and improve their health, and body," he said. A hospital statement said that as the boys continue to recover, they remain susceptible to infectious disease. To avoid mental stress, they should spend at least the next month only with family and friends, avoiding media encounters that might trigger post-traumatic stress disorder symptoms, the statement said. The sole fatality of the rescue operation, former Thai navy SEAL Petty Officer Saman Gunan, was granted a posthumous promotion to lieutenant commander by King Maha Vajiralongkorn Bodindradebayavarangkun and given the royal decoration of Knight Grand Cross (first class) of the Most Exalted Order of the White Elephant, the SEALs said Saturday on their Facebook page. Saman, 38, was a volunteer who had been engaged in the important mission of helping replace oxygen canisters along the route to where the boys were sheltering to make the hours-long passage possible. He collapsed and died on July 6 while diving; according to some officials, his own oxygen supply ran out. The government of Thailand released new footage showing the boys recovering at a hospital after they were trapped in a flooded cave for 18 days. The former SEAL is being honored as a national hero, and his cremation ceremony was being held Saturday in his home northeastern province of Roi Et. 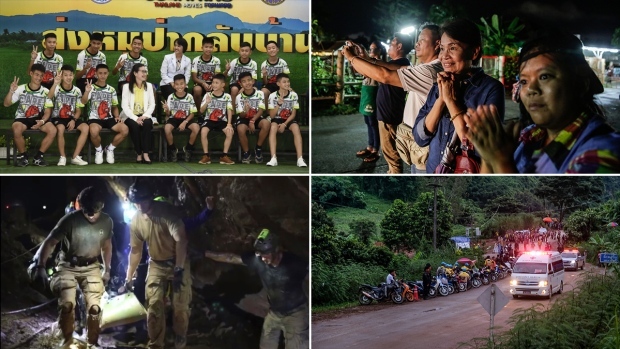 In the area in northern Thailand around the cave, more than 4,000 volunteers were reported to have taken part Saturday in trying to restore the landscape, which was damaged by the massive rescue effort that included the flooding and clearing of land and the use of heavy machinery.